Is Running While Pregnant Safe? Running can be a great and inexpensive way to exercise, keep muscles toned, and burn calories. After all, all you need are a pair of sturdy running shoes. But is running while pregnant safe? That depends. Pregnant women, in general, should exercise for about 30 minutes a day. It helps keep their bodies fit and helps strengthen muscles used during delivery. But 30 minutes is just a guideline and each individual woman varies on her abilities and medical restrictions while pregnant. This is why consultation with a woman’s medical team should be sought before any decisions are made regarding a woman’s workout. Pregnancy is a time to focus on being healthy, but if one is not an avid runner already, pregnancy is not considered the best time to take up running. During the first three months when the fetus’ organs are developing, spikes in body heat can actually have an adverse effect on development. And what’s more, during pregnancy, a hormone called relaxin is secreted that loosen the joints to make the stretching of the pelvis possible during delivery. Because joints are loosened, there is an increased risk of injury in women who are not already toned and regular runners. Running naturally puts stress on the knees and ankles and it is important to consider how the joints, center of gravity and back will be affected. Also, some women experience discomfort in their abdomen from jostling the baby while running. 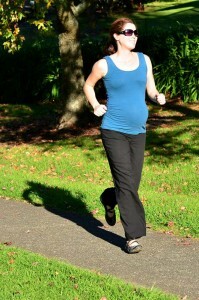 Women who are trained runners, however, often run during pregnancy with no issue. Clara Horowitz Peterson, for example, a professional runner from California, previously sponsored by Nike Trail and also a former runner for New Balance, has run through four pregnancies with no trouble. However, it is important to note that she worked with her doctor and made sure she was always careful not to overdo her workout, and most importantly, always listened to her body. Women like her usually continue to remain consistent in their exercise and keep running with few to no problems. Running during pregnancy can be risky for women who are not already strong and regular runners, and even if you are a runner who chooses to keep running while pregnant, make sure you are discussing your fitness routine with your doctor and taking precautions. But if weight loss is the goal, pregnancy is not the time to start thinking about it by initiating a running routine. And don’t forget, there are plenty of other exercises that can be done safely while pregnant apart from running, too. Antidepressants During Pregnancy: Are They Safe? Pregnancy Oral Health: Is Fluoride Safe?